If you're into paragliding or hang gliding, South Africa has a real treat in store for you - the sky is the limit! In the country's hot interior, amazing thermals have helped many paraglider and hang glider pilots to record-breaking distance flights, particularly in the Northern Cape province. But this flat, hot area doesn't have much in the way of cool relief – for that, you can to head to the coastal Eastern Province, KwaZulu-Natal or Western Cape, or inland to Mpumalanga province. There are loads of excellent ridge soar and some fantastic scenic flying near the coast. In Cape Town, you can launch off Lion's Head in the evening, fly into the sunset, and land at one of the popular beachfront pubs. Further up South Africa's coast, near the town of Wilderness on the Western Cape Garden Route, you can fly over the sea, often seeing dolphins and whales. And the high-lying areas of the Western and Eastern Cape, and the Drakensberg Mountains in KwaZulu-Natal and Mpumalanga, offer spectacular scenery. There is even reasonable flying about 80 kilometres from Johannesburg, near Hartbeespoort Dam, where you can fly under the controlled airspace of a number of medium-sized airfields and OR Tambo International Airport. 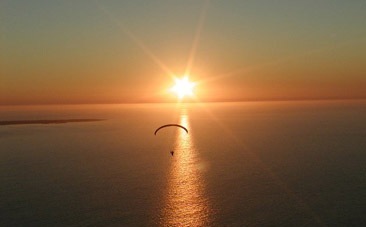 Birdmen Paragliding is located in Table View, Cape Town. They teach paragliding in Cape Town and the surrounding areas, and provide tandem flights, if required. For those wish to travel further afield, anything from one-day trips up to guided tours lasting as long as three weeks are available. Blue Sky Paragliding South Africa is situated between Durban and Pietermaritzburg and specialises in paragliding, powered paragliding and para-trike instruction, in addition to offering many courses. They also provide tandem flights. In addition, they undertake tours which over the years have included the Netherlands, Porterville, Wilderness, and the Valley of Desolation. Most of the sites they fly are in KwaZulu-Natal, ranging from Zululand to the Drakensberg. Cape Town Tandem Paragliding offers flights in and around Cape Town with pilots carrying South African Hang gliding and Paragliding Assocation certification. Flights further afield, to Hermanus and Sir Lowry's Pass are also available. In addition, in-flight photography is offered. Cloudbase Paragliding School is based in the Eastern Cape town of Wilderness. There are 24 flying sites within an hour's drive. They range from easy coastal soaring to cross country thermals. Cloudbase offers a number of different tours, including the Smile while you Scream Tour that visits the Alps in Europe. There is also the 14-day Ski/Fly Alpine Tour that includes skiing, snowboarding, and flying. Other destination include the Garden Route and Hermanus. Downhill Adventures offer paragliding tours around the Cape Peninsula with internationally qualified guides. The sites they frequent are Lions Head, Signal Hill, Sir Lowries Pass, Hermanus, Franschhoek Pass, Dassklip Pass (Porterville), Noordhoek and the Garden Route from Wilderness to Port Elizabeth. Tandem Paragliding is available for those who have no previous experience of paragliding. Eagle Encounters offers hang gliding training in Wilderness on the Eastern Cape coast. It has been training hand gliding pilots since 1986 and offers a number of different courses. Eagle Encounters fly each and every day, depending on the weather. Their website includes a useful question and answer section to help you understand what hang gliding is all about. The Eternity Press Paragliding in South Africa is a flying site for pilots who paraglide or hang glide, or for anyone who wants to. It offers useful reviews of paragliders, a list of South African free-flying sites, a complete introduction to flying in South Africa, books, and DVDs among other things. Extreme Scene are adventure tour specialists. They offer tandem paragliding in Cape Town, during which you can take in Table Mountain, Table Bay, and the Atlantic Seaboard. 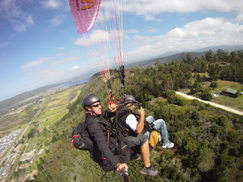 Tandem paragliding is also offered at Hermanus and Franschoek, while videos of the trip may be made as an optional extra. Extreme Sports Cafe operates from Wilderness on the picturesque Garden Route. It is a magnificent part of South Africa and ideal country to view from a paraglider. Various courses are offered, in English, French and German, and tandem flights are also available. Flying Unlimited has been training students in powered paragliding since 1995. It also supplies equipment and the website features extensive information on all aspects of the sport. Flying Unlimited is based in Pretoria and flying is done from the Groen Goud farm. Fly Time Paragliding is based in Sedgefield on the Garden Route, an area blessed with fantastic natural beauty. Courses are offered in English and German. If it's a thrill you're after, no experience or training is needed for a tandem flight. FlySa.net is available in English and German and presents a useful overview of paragliding in South Africa and Namibia. Information on safety, the South African Hang Gliding and Paragliding Association, competitions, DIY and guiding, hanggliding and powered paragliding is provided. Fun Ventures Paragliding School is located in Edenglen in Johannesburg. They offer paragliding training and courses, with the traditional mountain training method and with winching from the ground, with winching the preferred method because of the relative flatness of Gauteng. They also offer tandem flights which, like the courses, can be booked through the website. In addition there is a useful collection of links, to be found under "selection list" at the bottom of the webpage. The Parachute Association of South Africa oversees skydiving in South Africa. On the website, you can find out how to get started and what's on offer. It lists drop zones, and show jumping operations, and provides contacts for the people in charge of the many disciplines that make up the Sports Skydivers' Association. Events' listing is also provided. Paragliding Adventures, initially known as SA Paragliding Tours, was founded in 1998. They operate out of the Dunnotar Winch Park at the now disused Dunnotar Military Base on the East Rand. They also use Vaalkop in Mpumalanga and Bilene in Mozambique. New and second-hand equipment is available. Team Building is also available and is aimed at groups of five to 10 people. Paragliding Afrika conducts paragliding and paramotoring courses and tours for beginners up to intermediate level pilots. They operate out of beautiful Wakkerstroom on the Mpumalanga/KwaZulu-Natal border. Winch flying and conversion courses at Dunnottar, just outside Johannesburg are also offered. Paraglide-South-Africa.com is a website that provides local and international pilots with information on paragliding, resources, and places to stay when flying in South Africa. The website specializes in tours, trips, vacations and accommodation in South Africa. You can find out information on paragliding schools, flying sites, and tandem flights. Parapax offers tandem paragliding flights around Cape Town. They have experienced internationally qualified and guides, who are able to take passengers without any previous experience up into the skies. In-flight photography and videography is also on offer. Flights are not restricted to around Cape Town only, with Hermanus, Sir Lowries Pass, Franschhoek, Koringberg, Porterville, Macassar Beach, and Picketberg among the venues available. Para-Taxi Tandem Paragliding offers tandem flights with South African Hang and Paragliding Association-approved tandem instructor pilot. Typical flights last from 10 to 25 minutes, take in the stunning Cape Peninsula, and take place from many different sites around Cape Town. Flights may also be undertaken in the winelands, around Franschhoek and Paarl. The Skywalk School of Paragliding is in Pretoria, Gauteng. They present introductory and basic courses with their own equipment, and an advanced course for those with their own equipment. They also have a fly-away on the first weekend of every month. Skywalk also sells a wide range of paragliding equipment, ranging from gliders, helmets, harnesses, accessories likes caps, bags and clothing. They ship to anywhere in the world. The Soaring Society of South Africa is the national body for soaring/gliding in South Africa, and affiliated to the Aero Club of South Africa. It has, among other things, a list of gliding clubs in South Africa, and the SA Soaring Magazine. It also features a calendar of upcoming competitions and a forum. The South African Hang Gliding and Paragliding Association is the governing body for legally flying paragliders, hang gliders, powered paragliders, powered hang gliders and para-trikes in South Africa. All pilots that part take in these sports must be licensed by SAHPA, as required by the Civil Aviation Act. The website offers useful information on paragliding, hang gliding, powered paragliding, competitions, schools, and clubs. Viedo clips and galleries are also featured, as well as links. The Wallend-Air School of Paragliding is located in Pretoria. They offer plenty of courses, as well as tandem flights and powered paragliding. Equipment is also available, and there is an events calendar on the website, in addition to information on the Glen Club, and a gallery to show you what it's all about. Wild Sky Paragliding School, which has been running since 1993, is headed up by Hans Fokkens, who has his national colours in the sport. The school offers flying in and around Bulwer Mountain, on the edge of the southern Drakensberg. Tandem flights are available and lodging is also offered. Various other activities around Bulwer make for a good getaway experience. Windmaster Paragliding presents a number of courses, tandem flights, and fly-aways. On the Garden Route, Windmasters hosts flights from 16 scenic coastal sites. They also offer hiking trails, horse riding, abseiling, black bass fishing, two hobie sailing, kayaking, canoeing and kite surfing, as well as backpackers' accommodation. Xplorer Paramotors provide a backpack-style aircraft engine, designed to convert paraglider wings to powered paragliding (PPG). They offer PPG training at the training field at Dolphin Beach in Cape Town. New and used gear is available, including accessories. Professional aerial photography is also on offer.